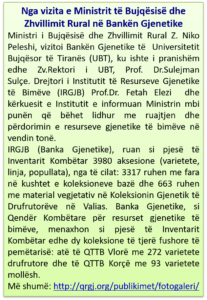 In Albanian genebank processing of germplasm includes a) sample seed processing steps as: seed drying, seed cleaning, seed moisture content and seed packaging; and b) germplasm testing procedures as: viability testing, and health diagnosis (purity and health testing). Transgene detection (OMG testing) is not yet realized. Each steps is realized using recommended international standards on samples processing procedures. (Read more: Manual of Seed Handling in Genebanks, 2006; Descriptors for Seed Processing and Management_2017. Seed storage is the preservation of seeds under controlled environmental conditions that maintain seed viability for long periods. The longevity of seeds depends on initial seed quality, moisture content and temperature during storage. In general, low moisture content and low temperature reduce the loss of seed viability. Different combinations of moisture content and temperature can be used to prolong seed viability during storage. 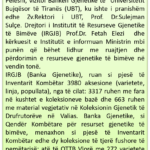 Currently, two main typesof seed collections are maintained in Albanian genebank (base collection and active collection). Base collections: A base collection is a set of accessions in which each is distinct and as close as possible to the original sample in terms of genetic integrity. Genebank do not distribute seeds from base collections directly to users, but seeds are only used to regenerate active collections. To maintain seed viability, base collections are stored in freezers for long periods at -18° to -20°C. Base collections of genebank include a total of 3219 accessions maintained as seeds under long-term conservation. Active collections: Active collections consist of accessions that are immediately available for multiplication and distribution to the users. Because these accessions are accessed frequently they are maintained in conditions that ensure at least 65% viability of seeds for 10 – 15 years. Seeds of active collection are used as breeder’s collections, for regeneration, for evaluation, research purposes and distribution to farmers or other interested users. There are about 370 seed accessions of 12 crops / species maintained in conditions of active collections in genebank. Storage facility: Collections in Albanian genebank are small, therefore sub-zero temperatures are used, and freezers are considered as a cheaper option for seed storage.